Long-running fishing industry mag that has been the voice of the business since 1913, Fishing News is a newspaper style weekly that covers all the fishing relevant news. Buy a single copy or subscription to Fishing News magazine. Fishing News is a long running magazine, and has been the voice of fishing since 1913. This weekly magazine covers every element of fishing news. In the Fishing News net you will find tasty titbits of news and information affecting what is going on in the fishing industry, including comments and opinions on topics such as fishing quotas and policy changes. 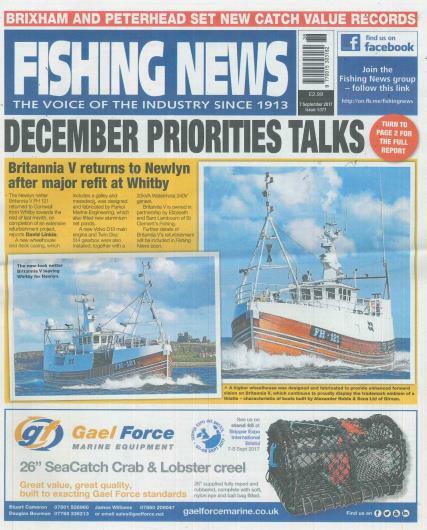 Fishing News also covers European fishing news, coverage of events, expos and trawl races, and includes letters from the fishing community, buyers guides, public notices, pictures from the past and ports and prices. Buy a single issue, or subscribe with Unique Magazines and never miss an issue.